MariaDB 10.1 and MySQL 5.7 have been officially GAed for a few weeks now, and each company claims to have awesome performances. MariaDB claims that the biggest improvement on its new version is scalability on massively multithreaded hardware, reaching more than 1 million queries per second on a simplified OLTP benchmark. 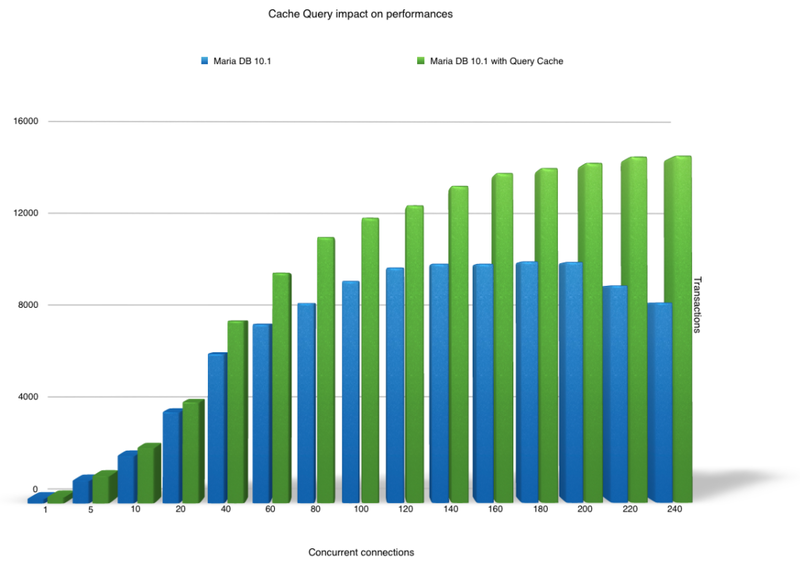 On the MySQL side, the same type of improvement is achieved on mixed OLTP_RO benchmark. OLTP benchmarks are great, but what is the behaviour of MySQL / MariaDB on real world applications ? 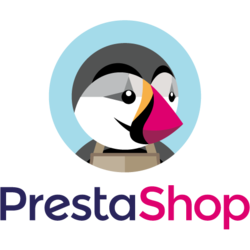 We chose to mesure the performance of MySQL and MariaDB on Prestashop 1.6.1.2 which includes our optimizations to improve both the single-threaded and multi-threaded performances. We used a massively multithreaded hardware, an IBM Power 8 S822LC system with 2x10 cores @2.92GHz running in SMT8 mode (160 threads), 256GB of RAM to have the full DB in memory and running on Ubuntu 15.10. Memcached is used with 128MB of memory. When used, the query cache is set to 128MB. The benchmark results are the average of 5 "siege -i -b -t 20S" (20s benchmark), on a few representative pages, which are generating both read and write operations. 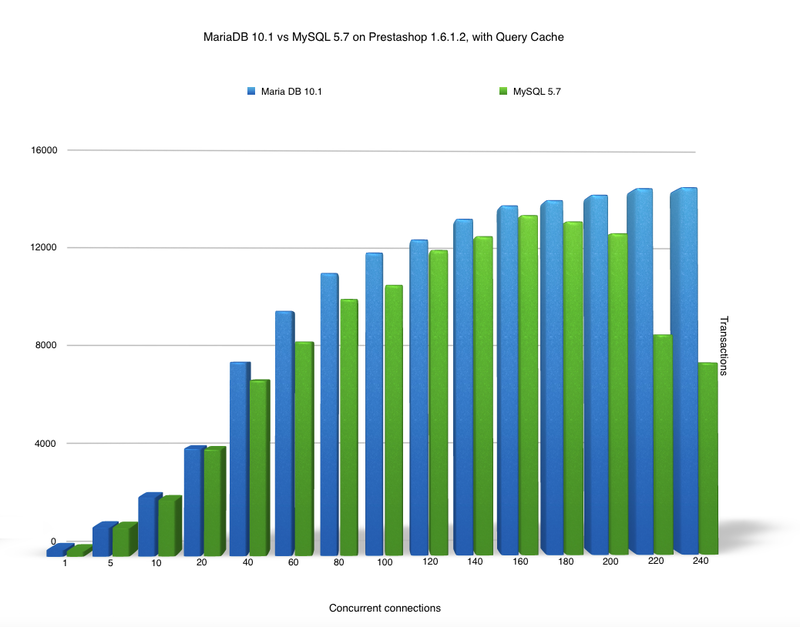 MariaDB 10.1 is faster than MySQL 5.7 at low concurrency, up to 11% @20 concurrent connections. It confirms what we can read from the community, complaining the single threaded performances on the MySQL side are problematics. In real world web server configuration, the query cache is often enabled, which is great most of the time. 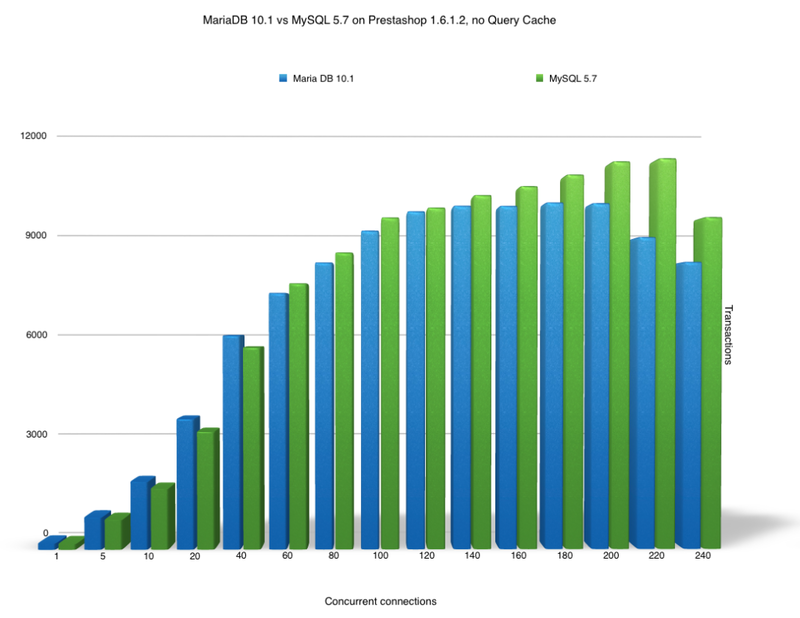 In this configuration, and extrapolating the performance we are seeing with Prestashop, MariaDB 10.1 clearly outperforms MySQL 5.7 on massively multithreaded hardware. We should be able to run a few more tests on multicore Intel processor in a few weeks. We're receiving a lot of questions about our optimizations on the kernel side, more to come on that too, stay tuned and register to our newsletter (no spam, we promise! ).